This handout picture taken on Oct. 21, 2012 by the Zimbabwe National Parks agency shows a much-loved Zimbabwean lion called "Cecil" which was allegedly killed by an American tourist on a hunt using a bow and arrow. "If, as has been reported, this dentist and his guides lured Cecil out of the park with food so as to shoot him on private property ... he needs to be extradited, charged, and, preferably, hanged," People for the Ethical Treatment of Animals said in a statement Wednesday. The statement, emailed to The Associated Press, came from Ingrid Newkirk, president of the animal rights organization. Social media on the internet – for example on Twitter under #cecilthelion – were also filled with condemnation of the killing of the black-maned lion just outside Hwange National Park in Zimbabwe. The Zimbabwean men – a professional hunter and a farm owner – are accused of helping Walter James Palmer hunt the lion. Zimbabwean police said they are looking for Palmer, who reportedly paid $50,000 to track and kill the animal. During a nighttime hunt, the men tied a dead animal to their car to lure the lion out of a national park, said Johnny Rodrigues, chairman of the Zimbabwe Conservation Task Force. The American is believed to have shot it with a crossbow, injuring the animal. The wounded lion was found 40 hours later, and Palmer shot it dead with a gun, Rodrigues said. "I had no idea that the lion I took was a known, local favorite, was collared and part of a study until the end of the hunt. I relied on the expertise of my local professional guides to ensure a legal hunt," Palmer said in statement through a public relations firm. The two Zimbabwean men appeared at the Hwange magistrate's court, about 435 miles (700 kilometers) west of the capital Harare, to face poaching charges. Defense lawyer Givemore Muvhiringi says the proceedings have been delayed by several hours because prosecutors are "making their assessments." If convicted, the men face up to 15 years in prison in Zimbabwe. 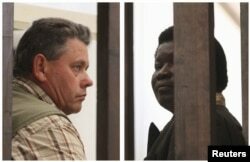 A combination photo shows Zimbabwean safari operator Honest Ndlovu (R) and fellow countryman and hunter Theo Bronkhorst waiting to appear in Hwange magistrates court, July 29, 2015. The professional hunter who allegedly acted as Palmer's guide has been stripped of his license while he faces criminal charges, the Zimbabwe National Parks and Wildlife Authority and the Safari Operators Association said in a joint statement. The farm owner also facing criminal charges did not have a hunting permit, the joint statement said. Palmer has several hunts on record with the Pope and Young Club, where archers register big game taken in North America for posterity, said Glenn Hisey, the club's director of records. Hisey said he didn't have immediate access to records showing the types and number of animals killed by Palmer, but noted that club records involve legal hunts "taken under our rules of fair chase." According to U.S. court records, Palmer pleaded guilty in 2008 to making false statements to the U.S. Fish and Wildlife Service about a black bear he fatally shot in western Wisconsin. Palmer had a permit to hunt but shot the animal outside the authorized zone in 2006, then tried to pass it off as being killed elsewhere, according to court documents. He was given one year probation and fined nearly $3,000. He is believed to have been killed on July 1 in western Zimbabwe's wildlife-rich Hwange region, its carcass discovered days later by trackers.